I forgot to ever show you the card I made for the smART-Word challenge this month. The challenge word was "glitter," and I chose to use glittery embossing powder on my card. If you know me, you know that HATE to emboss, and why I even have glittery embossing powder is sort of a mystery...but it works. This is the Geraniums image, which is from the Angi-B line - I watercolored the image using Marvy LePlume markers and a waterbrush. I added a pattern below the pots with a white gel pen. The sentiment is from the set called Scatter Delight Bloom, and is stamped on a diecut label that I purchased at a cute little antique shop in CA. The double bow was tied with my Bow-Easy. Love that little thing. 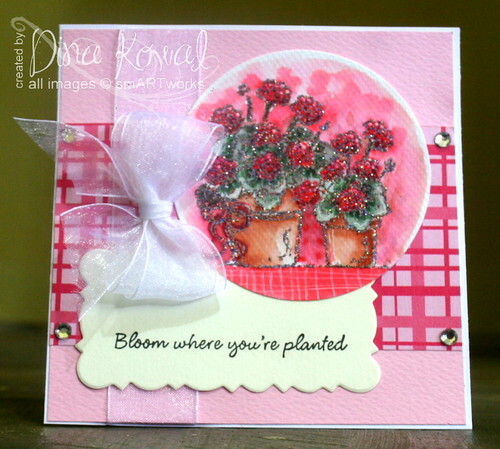 I love this textured pink cardstock - it was a recent local find. Always nice to find nice things here at a nice price...I think a pack of 20 sheets was just around $2! If you have a glittery or glitter-inspired card, why not link it up and join our challenge? You can click here to link to the post for this month. A prize of stamps is up for grabs - but hurry - you only have until the 25th! Next month's challenge is based on a word I chose...can't wait for that one! P.S. This EP, by the way, is from Sparkle-n-Sprinkle - and if you are a lover and collector of embossing powders, you will love their line.